Importance of diagnostic procedures and client education in demodicosis: An evidence based study. The successful therapeutic management of generalized demodicosis depends on the early diagnosis of disease, opted treatment protocol and the client education. Diagnosis of the demodicosis is done by examination of the skin scrapings, trichogram study and biopsy procedures. Deep skin scrapings are best for the confirmatory diagnosis, trichogram is advisable where scrapings are unable to collect like peri-ocular, inter-digital space and skin folds. While collecting the scrapings, squeezing the skin increases the positive test results. Education of the owner starts from the visualization of live mite under microscope, explanation about the life cycle of mites, transmission to the other animals and humans, course of the disease, symptoms, duration of treatment and cost of medicines, follow-up visits, frequent skin scrapings examinations, immunity of the dog, revisits after complete clinical cure, breeding of the dogs and its zoonotic importance. Demodex, Diagnosis, Owner, Education, Skin scrapings. Canine demodicosis is one of the common parasitic skin infections in dogs in association with the genetic or immunologic disorder. The disease can be classified based on the distribution of the lesions and onset of lesions in relation to the age i.e. juvenile or adult onset . Huge literature was available on the management of demodicosis but, it is a challenging task for every case . Huge proliferation of the mites in the hair follicles and sebaceous glands leads to severe alopecia, erythema, pustules and furunculosis . The success of the treatment depends upon the identification of the underlying diseases, post-treatment monitoring and treatment beyond the clinical and microscopic cure . Literature is available on the client education in the form of peer-reviewed articles. But, evidence-based client education was not there . Hence, present communication reports about the importance of diagnostic procedures for diagnosis of demodicosis and client education to prevent recurrence of demodicosis in dogs. During the three-year period of observation (2013 to 2015) at College of Veterinary Science, Proddatur twenty-two dogs were identified that they were suffering from clinical demodicosis. Demodicosis was confirmed by the presence of different stages of Demodex spp. mites in skin scrapings . A thorough clinical examination was carried out of the individual dog, for the presence of the primary and secondary lesions and also for the presence of ectoparasites. With help of sterile surgical blade, multiple skin scrapings were done in the direction of the hair growth. The skin was squeezed while a collection of the scrapings skins and scrapings were done until capillary bleeding. Trichogram was carried out by haemostatic forceps in the direction of the hair growth and placed in a drop of liquid paraffin on a glass slide. After the gentle squeezing of the skin fold, tape impression smears were collected from the dry skin lesions and wet impression smears were collected from the wet skin lesions. Transparent acetate tape was placed on the dry lesion site and by applying the pressure using the thumb and index fingers samples have to be collected. After that tape was removed and placed on a microscope glass slide for further examination. Slide impression smear was prepared from the wet lesions. While collecting the smear, the crust should be removed; the surface of the lesions should be opened. Clinical samples were examined under low power microscope and it was confirmed by the higher magnification [3,7]. Demodicosis was diagnosed in the clinical samples collected by different procedures including skin scrapings (Figure 1), trichogram (Figure 2) and impression smears (Figure 3) in all the dogs. Dogs with moderate to severe disease, trichogram examination are a sensitive procedure. But, a negative hair pluck does not exclude demodicosis and should be followed by deep skin scrapings. Dogs with superficial demodicosis due to Demodex cornei was identified in the impression smears itself. Differentiation of the different types of Demodex mites can be done by morphology and micrometric measurements. Deep skin scrapings are best for the confirmatory diagnosis, trichogram is advisable where scrapings are unable to collect like periocular, inter-digital space and skin folds. While collecting the scrapings, squeezing the skin increases the positive test results. The sensitivity of the diagnostic procedure varies between clinicians because of their dedication towards the clinical cases and their keen observation for the lesions while the collection of the samples. Figure 1. 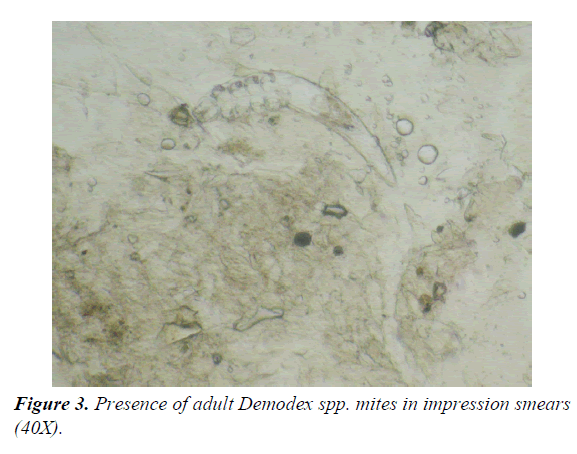 Presence of adult Demodex spp. mites in skin scrapings (40X). Figure 2. 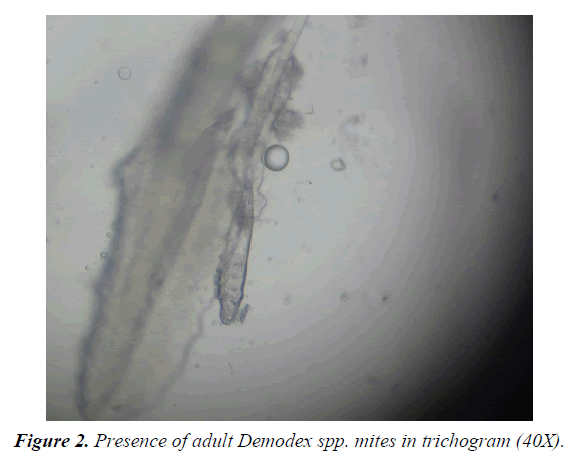 Presence of adult Demodex spp. mites in trichogram (40X). Figure 3. Presence of adult Demodex spp. mites in impression smears (40X). Pereira et al. reported both adhesive tape test and skin scrapings are best for diagnosis of demodicosis. But, Cury et al. reported adhesive tape test, hair plucking examination and deep skin scrapings varies their sensitivity in the diagnosis of demodicosis. Sivajothi et al. reported mixed infestation of Demodex canis and D. cornei in dogs and utilized the combination of both hair pluck and tape impression smears examination. By the application of the mineral oil, mites adhere better to the instrument which prevents an escape of mites. Squeezing the skin, mites from the deep follicles will come to the surface of the skin (Shrestha et al.). By application of pressure, all the mites came out from the follicles will stick to the tape [6,7,12,13]. The complete effective therapeutic protocol includes multimodal approach. While the formulation of the therapeutic protocol, it is essential to consider the age of the dog, type and distribution of skin lesions, immune status and presence of secondary infections and underlying factors . Out of twenty-two dog owners, five owners have followed the suggestions and no recurrence of the demodicosis was noticed even after two years of therapy. Seventeen dogs (77.2%) showed the recurrence of the demodicosis. Among the recurrence demodicosis dogs, 82.35% dogs due to improper follow-ups (14/17), 58.82% dogs due to inadequate duration and dosage of drugs (10/17), 41.17% dogs due to failure to attend to the hospital after clinical recovery and negative scrapings (7/17), 35.29% dogs due to malnutrition (6/17), 23.52% dogs due to failure to identify the underlying factor (4/17) and 17.6% dogs due to lack of time to the owners to take care of the pets (3/17). In the previous literature, the importance of nutrition and age-related diet, management of concurrent gastrointestinal parasitic infections and other stress factors were explained. Dogs with the severe infection fluids, systemic antibiotics and anti-inflammatory drugs were advised . Literature suggests that frequent visits to the clinician, examination of the skin scrapings for every four weeks, continuation of the treatment until two consecutive negative skin scrapings are required to prevent recurrence. After the miticidal therapy, if active mite population is there, which indicates the presence of some underlying factors . Reported underlying factors in demodicosis are: withhold of glucocorticoids and other immune suppressants, avoidance of avermectins along with the azole antifungals, breed specificity, other systemic diseases and stress-related factors . All the procedures for diagnosis of demodicosis were equally important and the sensitivity of the diagnostic procedure varied between the clinicians. Client education starts from the visualization of live mites, zoonotic importance, duration and cost of the treatment, frequent follow-up visits, immunity of the dog and revisits after complete clinical cure. The authors are thankful to the authorities of Sri Venkateswara Veterinary University for providing the facilities to carry out the work. Miller WH, Griffin CE, Campbell KL. Parasitic skin diseases. In: Muller & Kirk’s small animal dermatology. 7th ed. St. Louis: Saunders; 2013;p:310-3. Reddy BS, Kumari KN. Demodicosis and its successful management in dogs. Indian J Field Veterinarians. 2010;6(2):48-50. Mueller RS, Bensignor E, Ferrer L, et al. Treatment of demodicosis in dogs: 2011 clinical practice guidelines. Vet Dermatol.2012;23(2):86-96, e20-1. Singh SK, Kumar M, Jadhav RK, et al. An update on therapeutic management of canine demodicosis. Vet World. 2011;4(1):41-4. Gortel K. Update on canine demodicosis. Vet Clin North Am Small Anim Pract. 2006;36(1):229-41. Sivajothi S, Reddy BS, Rayulu VC. Demodicosis caused by Demodex canis and Demodex cornei in dogs.J Parasit Dis. 2015;39(4):673-6. Cury GMM, Pereira ST, Botoni LS, et al. Diagnosis of canine demodicosis: comparative study between hair plucking and adhesive tape tests. R bras Ci Vet.2013;20(3):137-9. Moriello KA. Treatment of Demodicosis in Dogs & Cats. Consultant on Call, NAVC Clinician’s Brief, 2011;p:17-20. Reddy BS, Kumari KN, Rao VV, et al. Efficacy of Enrofloxacin in the Treatment of Recurrent Pyoderma in Dogs. J Advan Vet Res2014;4(3):108-12. Arsenovic M, Pezo L, Vasic N, et al. The main factors influencing canine demodicosis treatment outcome and determination of optimal therapy. Parasitol Res. 2015;114(7):2415-26. Reddy BS, Sivajothi S. CD4+ and CD8+ T cells in the peripheral blood of dogs affected with generalised demodicosis, Comp Clin Pathol. 2016;25(2):295-7. Pereira DT, Castro LJM, Centenaro VB, et al. Skin impression with acetate tape in Demodex canis and Scarcoptes scabieivar. vulpesdiagnosis. Arq Bras Med Vet Zootec. 2015;67(1):49-54. Shrestha D, Thapa B, Rawal G, et al. Prevalence of demodectic mange in canines of kathmandu valley having skin disorder and its associated risk factors. Int J Appl Sci Biotechnol. 2015;3(3):459-63. Sandra NK. Updates on the Management of Canine Demodicosis. TVP J. 2017;7(1):77-85. Mueller RS. Treatment protocols for demodicosis: an evidencebased review. Vet Dermatol. 2004;15(2):75-89.